The new materials you need to teach the next eight lessons of Essentials! 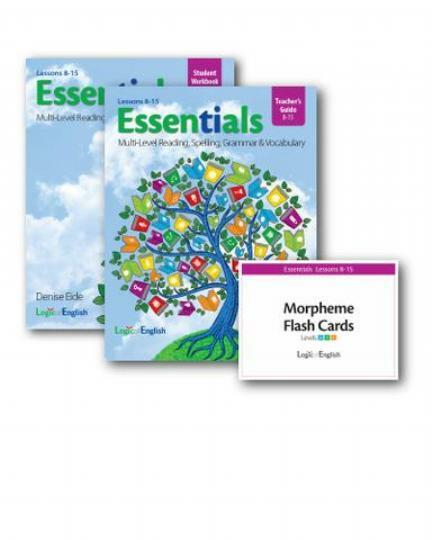 In this section of Essentials, students build on the phonograms and spelling rules they learned in the first seven lessons of the program and go further, building their spelling, reading, grammar, and vocabulary skills as they practice previous concepts, learn new ones, and apply these skills to analyze the spelling of new words. Along the way, they practice what they are learning through games, critical thinking activities, and multi-sensory practice. -Three levels of application within each lesson allow you to customize the level of difficulty in order to provide the right level of challenge for each student as you go. Level C also introduces eight new advanced phonograms. You will also need the reusable supplements used throughout Essentials, found in the Essentials 1-7 Complete Set. The 8-15 Set is designed for those who have already completed Essentials Lessons 1-7. Order this set, plus an additional workbook for each additional student. Students will also need the Spelling Journals they started in Lessons 1-7.